JOHNNY WILL BE SIX IN OCTOBER… but the war has taken away his birthday present – that BSA Junior bicycle his Dad promised him. We’re sorry to disappoint you Johnny – but we promise not to forget you. We can’t make your machine now because soldiers need bicycles – and it’s out job to supply the soldiers first. But we’ll tell you something – we’ve learnt a lot about making bicycles in wartime, and by waiting until the war ends you’re going to get a much better one than you’ve ever imagined. 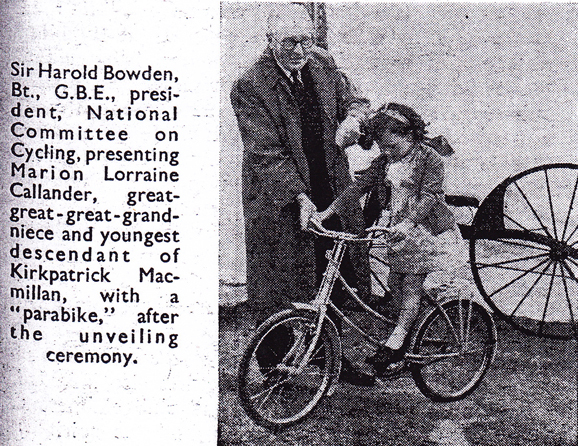 When you go riding down the street on your post-war BSA Junior bicycle you’ll be the envy of all your friends, and they’ll be asking you for a ride on your exciting new bicycle. You’ll be glad you waited then! It’s interesting to compare it to the adult version – the BSA Airborne Paratrooper’s Bike – because they both use the same duplex frame tubing. The BSA Junior Parabike was inspired by the BSA Airborne Bike used during WW2. Not everyone’s father would have used a BSA Airborne Bicycle. But no doubt most boys and girls would have wished their fathers had jumped out of planes with paratrooper bikes to help defeat the enemy, as portrayed on the wonderful Junior Parabike advertising poster. 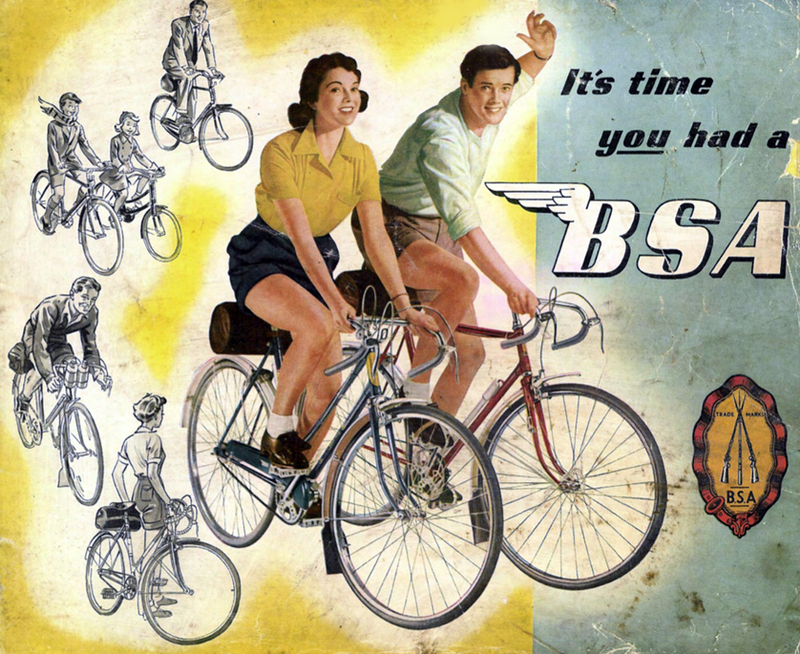 It was sound marketing strategy from BSA – as you can see from the poster, boys and girls could gaily ride their parabikes while army paratroopers parachuted down behind them with the real thing. This BSA Girls’ Junior Parabike is in unrestored original condition and is blessed with all its original parts, including the chaincase and rear carrier/stand, often missing. I am offering for sale a pair of Junior Parabikes, a Boys’ and a Girls’ version. If you already have the full-size BSA Airborne, this pair of juniors is a superb addition to your collection and guaranteed to bring a smile (and collectors’ envy) to all who see your WW2 military display. After WW2, industry was still controlled by the Government. Exports were the number one priority in order to repay the massive war debts. 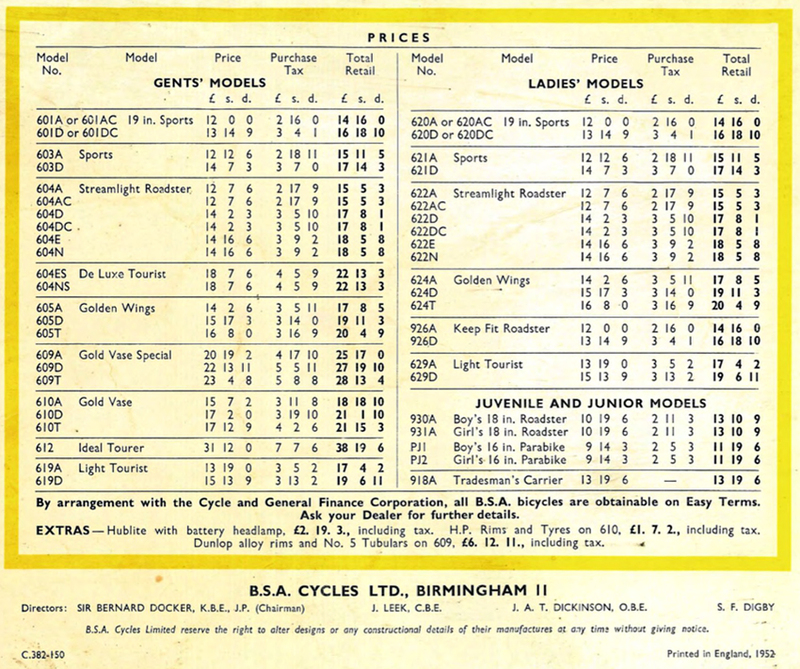 The BSA Junior Parabike was one of many product lines available for export. The correct name of the WW2 paratrooper bicycle is ‘BSA Airborne Bicycle’ although many people refer to it as a ‘parabike.’ When you observe these adverts, you can see how BSA themselves contributed the word ‘parabike’ to common usage.Very few Junior Parabikes have survived and most people now use the term to describe the original military version. Above, the girl’s version; below, the boy’s. As I’m sure you already know, Kirkpatrick Macmillan (1812-1878), mentioned above, claimed to be the inventor of the rear-wheel driven bicycle. It’s a shame these are such rare bikes. 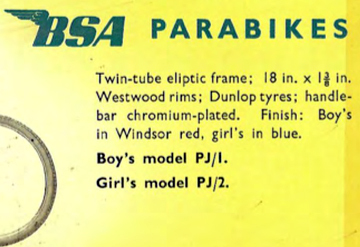 I’m sure lots of dads would love to buy Junior Parabikes for their sons and daughters to accompany them with their BSA Airborne bicycle at shows and rallies. 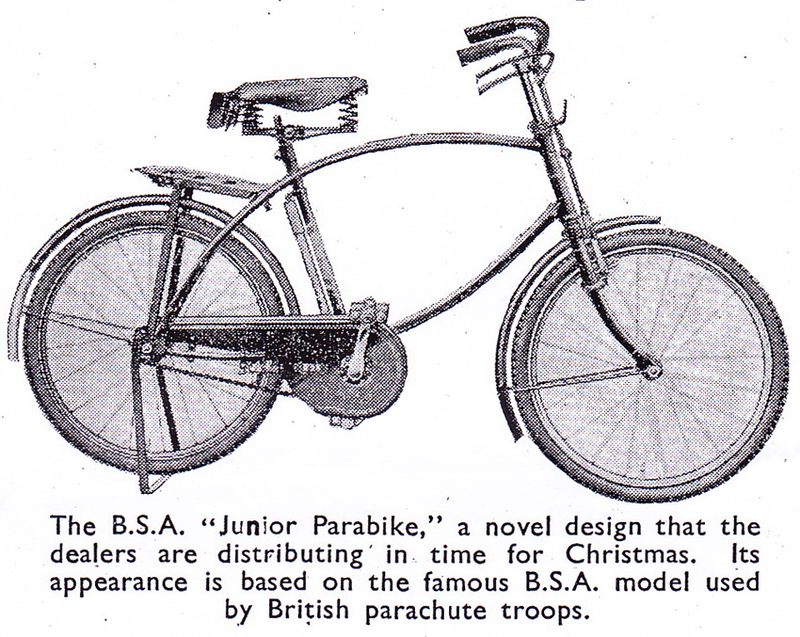 Compare the size of the Junior Parabike with an adult Airborne paratrooper bike: 18″ against 26″ wheels. When folded, the adult version is closer in size to the Junior. The photo below illustrates the identical duplex frame tubing.